DNA methylation, an epigenetic modification of a methyl group at the 5-carbon position of cytosine (5mC), has been found to be closely associated with carcinogenesis. Thus, genomic extracts holding this modification can be used as biomarker for sensitive detection of cancer, and these genomic DNAs can be collected from serum, plasma, urine, and stool. Nanopore-based direct methylation assay circumvents bisulfite conversion and PCR, suitable for screening of low sample volume obtained from genomic extracts. Methylated DNA is selectively labeled with methyl-binding proteins. Nanopore assay demonstrates discrimination of hypermethylated and unmethylated DNA on various length DNA fragments using sub 10 nm nanopores. Furthermore, low-methylated DNA fragments are differentiated from unmethylated DNA and the position of methylation is profiled using sensitive nanopore-based methylation assay. Fig. a. Schematic shows cross-sectional view of solid-state nanopore. Biomolecule transports the nanopore along with biased voltage across the nanopore. 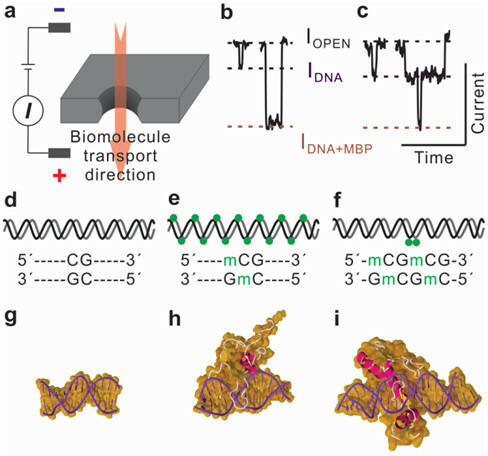 b and c. Representative electrical current signature of single biomolecule transports through the nanopore. b. Transports of short unmethylated 90 bp dsDNA fragments (left) and hypermethylated 90 bp dsDNA fully bound with methyl-CpG-binding proteins (right). c. Comparison of transports between short unmethylated 90 bp dsDNA fragment (left) and 90 bp low-methylated DNA bound with a single methyl-binding protein. d, e, and f. Schematics illustrate methylation profiles on short dsDNA fragments. Each Green dot represents symmetric methylated CpG dinucleotide. d. Unmethylation. e. Hypermethylation. f. Low-methylation. g, h, and i. Crystal structures show complex formation of methyl-binding protein on dsDNA. g. Bare B-form dsDNA. h. Methyl-CpG-Binding protein bound to symmetric CpG dinucleotides on dsDNA. i. Kaiso zinc finger protein bound to symmetric two adjacent CpGs on dsDNA.